Whether taking in the vibrant colors of fall, exploring the shoreline in Spring, or dashing through Maine snow, our hotel welcomes motor coach and tour groups to Ogunquit and the Southern Maine coast. 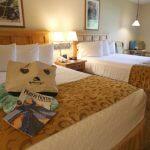 With friendly group rates and exceptional service, your tour will be comfortable and cozy from greeting to check out. Our hotel is happy to deliver the details – from tour rates to welcome receptions to luggage delivery. We welcome receptive tour operators, student travel planners and series tour operators to visit the facilities to learn more about our tour and motor coach services. Upon arrival, a custom greeting welcomes your tour to our family hotel. With Jonathan’s directly adjacent, farm to table Maine cuisine awaits your guests for an exceptional dining experience. Guest enjoy the flavor of Ogunquit’s art history with sculpture gardens, local paintings and a central location to the famous Marginal Way ocean walk. With over 30 years of tour experience, let our team provide a great value, excellent service and a cozy setting in the heart of Ogunquit Maine. For more information and to book your group, please call 207-646-9661 or email Tour Sales. Email Tour Sales for a proposal and additional details.